At age 15, I was seriously dedicating myself to cello studies, totally confident I was going to be a soloist à la Jacqueline du Pré. What budding female cellist would expect anything less? Fast forward to roughly 20 years later, and my life looks nothing like I imagined, despite my education at two major conservatories. And that’s not a bad thing! On a daily basis, like many of my NYC colleagues and friends, I find myself running around the city, living the freelancer’s life, from rehearsals with my chamber music ensemble, to subbing in a Broadway show, to the nearest maximum security prison for a songwriting workshop. Yes, it’s true: I’ve been playing in maximum security prisons like Sing Sing here in New York and Lee Correctional Institution in my native state of South Carolina. Perhaps prisons are unexpected venues for classical music, but my days at these two places most definitely are the ones I look forward to most – working with incarcerated people who are serving their sentences and also choosing to transform their lives through music. 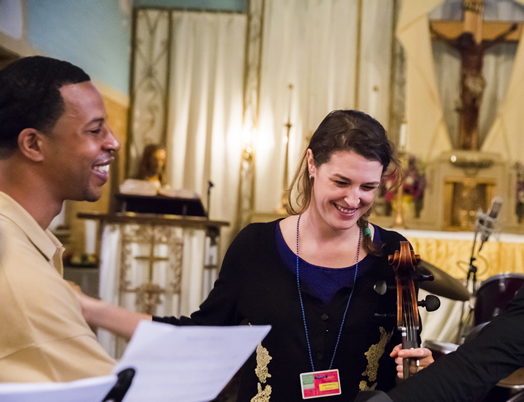 My ensemble Decoda began its work in the criminal justice system as part of Carnegie Hall’s Musical Connections Program, which places professional artists of all genres in community venues around the city, currently with a heavy emphasis on the justice system. I have been a proud member of Local 802 since 2008 and my fellow musicians in Decoda are all alumni of Ensemble ACJW, which has signed single-engagement contracts with Local 802. At our most recent concert at Sing Sing, we joined with jazz vocalist Sarah Elizabeth Charles and opera superstar Joyce DiDonato. Joyce gave a spine-tingling rendition of a Rossini double-aria to enthusiastic cheers, including a member of the crowd screaming, “You go, girl!” mid-melisma, followed by a baseball chant from the crowd, “Di-Do-Nato-Di-Do-Nato.” We were all privy to an incredible performance that just happened to be in prison! As a result of these programs, in December we were invited to perform at the White House as part of a special event called “Innovation & the Arts: Prison Reform and Reentry in the 21st Century.” The event was curated by Academy Award-winning actor Tim Robbins and his colleague, actress Sabra Williams, who run the Actors’ Gang Prison Project in California. The day was dedicated entirely to innovative arts programming as part of the president’s criminal justice reform goals, with particular attention to reentry into society. The event included Attorney General Loretta Lynch and other senior officials from the Obama adminiration. In attendance were also members of Congress from both sides of the aisle, government agencies, correctional staff, arts organizations and advocates and, of course, formerly incarcerated people. We presented three original songs written during past projects with incarcerated men. As musicians, we all know the life skills an artistic process can empower: a safe space to create, a sense of hope, feelings of self worth, collaborative skills, self reflection, problem solving tactics, personal motivation, listening skills, a sense of accomplishment, learning about risk and reward, leadership, adaptability, conflict and resolution, and empathy, among many, many others. Music and the arts have unique transformative powers for all people in our society, regardless of their prior exposure, expertise or experience. The White House event validates that artistic infusion in the justice system is not only critical, but vital. I feel privileged to have found this somewhat uncharted path for my artistic life. As much as music brings change to vulnerable populations, this work has revolutionized my own life. As artists, we are the vehicles for reawakening the humanity inside us all. To read more about Decoda’s work in the criminal justice system go to decodamusic.org/projects. For more on Claire Bryant, visit http://ClaireBryant.com.